Nearest: DLR Station: Blackwall 0.2 miles (0.3 km), Tube Station: Canary Wharf 0.5 miles (0.8 km), Railway Station: Limehouse 1.4 miles (2.3 km), Motorway: M11 Junction 4 6.5 miles (10.5 km). Located in the Docklands alongside the River Thames and near Canada Square (5 minutes) is the Fraser Place Canary Wharf Apartments. This location is also convenient for both the Excel Exhibition centre and London City Airport being close to the A1261 Dual carriageway which goes straight to the airport. Canary Warf has become a rival to the City of London as London's financial centre and is home to some exclusive apartments in this now fashionable location. This road also gives access into the City of London as well via the Docklands Light railway the nearest station being Blackwall. Shops, restaurants, bars, leisure and sports facilities are nearby. Nearest attractions include Old Royal Observatory, Tower Of London, HMS Belfast and the London Dungeon. The Fraser Place canary Wharf Apartments facilities include dry cleaning, 24-hour front desk and internet access. All apartments have bathrooms, fully equipped kitchens (fridge, microwave, washing machine), contemporary furnishings and living areas. Other facilities include cable TV, tea/coffee maker, direct dial telephone, microwave, hairdryer, ironing facilities, video and music systems (CD/DVD player) are also featured in each unit. Some apartments also feature a balcony. Apartments come in a range of configurations which are from one to three beds and deluxe, super deluxe, grand deluxe and superior options. most apartments have views of the Thames, Martina and Millennium dome. Each floor is served by a lift. Apartments are serviced weekly while extra house keeping is available for a charge. The onsite marina cafe (located in the lobby) has views over the marina and is open for breakfast every morning from 7.00 till 10.00. Also serves drinks and snacks. Fraser Place Canary Wharf Apartments has concessionary prices for guests at the nearby Reebok Sports lifestyle club. A meeting room that is suitable for 4 people is available. The reception, with a large lobby area, is open 24 hours and has a concierge service. Other services include a complimentary mid-week scheduled shuttle bus service within the Canary Wharf area. Guests can also purchase Extended Food & Beverage welcome packs. Laundry and dry cleaning services can be arranged. WiFi internet access connection within the apartments. Private parking is available on site and costs £10 per day. Compared to other London hotels: This hotel has been rated 84% by past guests. The London average is 80% and the average for 3 star hotels is 76%. Therefore this hotel is above average for its sector (star rating) and for London as a whole. Milesfaster ranking: 347th from 866 London hotels, and 90th of 329 three star rated hotels. Another to Consider: Also close by and a similar hotel (1.2 miles, 1.9 km) would be the 3 star Travelodge Southwark Hotel, whose lowest rates start at about £81 and which has an 80% guest satisfaction rating. If your mainly looking at apartments maybe have a look at the Citadines Holborn Covent Garden. It is 1.8 miles (2.9 km) away with rates from £111 having scored a guest rating of 82% and has: free WiFi. Would you prefer to go with something that has scored higher in guest satisfaction ratings? If that is what your after then the 4 Star citizenM Tower of London seems like a possible option. The citizenM Tower of London is only 0.1 miles (0.1 km) away. The citizenM Tower of London is one of the top rated London hotels with a 92% guest satisfaction rating. 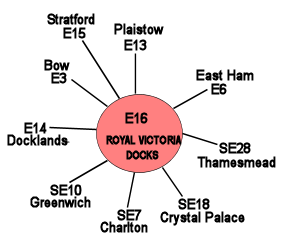 The closest fifty hotels around this area (80 Boardwalk Place, E14 postcode) that are listed on this website cover a 2.6 miles (4.2 km) radius. The numbers for each star rating are 4 five star hotels (average rating 90%), 20 four star hotels (average rating 85%), 17 three star hotels (average rating 80%), 7 two star hotels (average rating 77%) and 2 one star hotels (average rating 59%). Top 3 star hotels are Premier Inn Docklands Excel, Premier Inn Greenwich, Premier Inn Stratford and Qbic Hotel London City (all four with a score of 89%). The highest rating in the isa goes to Intercontinental London O2 Arena (5 star) at 93%. Base Rates: We look at what the average base rates are for the area and by star rating. These rates do not take account of offers and short term deals so are just a guide. If we look at the average for all hotels in the area (nearest 50) we get an average base rate of £83 per night. The lowest rates are at £35 at City View Hotel (1 Star, 56%) and highest base rates of £250 at Fox Apartments (4 Star, 90%). Averages for each sector of star rating: Five Star average: £146, Four Star average: £100, Three Star average: £65, Two Star average: £56 and One Star average: £37. We rank hotels based on our own proprietary algorithm based mainly on guest ratings but adjusted for influencing factors. We rank Fraser Place Canary Wharf 23rd (joint) of the 50 local hotels and 8th for the 17 three star hotels in the area. The hotel is 41st of 50 (17th of 17 three star hotels.) for lowest standard rates locally. Looking at the hotels rates plus its user rating we rank it 45th of 46 for sheer bang for buck (City View Hotel was top).